Published: June 20, 2014 at 05:05 p.m. 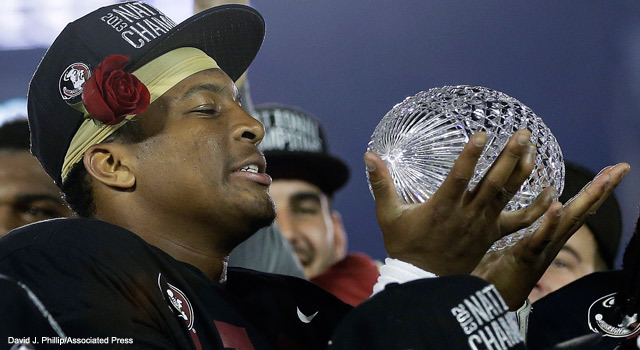 Updated: June 20, 2014 at 05:37 p.m.
Jameis Winston and Florida State hoisted the final BCS national championship trophy. The 2014 season marks the first for the College Football Playoff, which will feature a four-team playoff system. Below are the top 16 contenders to participate in the new playoff system, as well as some additional contenders to follow closely this fall. I see No. 12 as the breakpoint, with plenty of good teams rated No. 13 on down. The Seminoles will have to play 15 games to win the national championship. Very possible with Heisman quarterback and strong offensive line. The Sooners have five road games, but only one against an opponent with a winning record in 2013. They return their starting QB and have a future star in RB Keith Ford. Alabama is starting over at quarterback. AJ McCarron is out and in is Florida State transfer Jacob Coker. The Crimson Tide will start a freshman left tackle, but they have very good running backs. They open in Atlanta vs. West Virginia. The Ducks face UCLA on the road, but they have have nine days to get ready for the game. Team returns 13 starters, including Marcus Mariota, who is one of the country's best quarterbacks. The Buckeyes have a very good quarterback in Braxton Miller. They open against Navy in Baltimore, and will be challenged on the road against Penn State and Michigan State in a span of three weeks. The Spartans have a good quarterback and running back to go with a strong defense; they have been very good on defense. Michigan State doesn't have a very strong schedule, with the key game at Oregon in Week 2. The Spartans finish the regular season at Penn State. The Bruins have quarterback Brett Hundley returning, plus 17 starters, as well as the best two-way player in college football, LB/RB Myles Jack. The Bruins have a tough schedule, but are well-coached and will score a lot of points. The Bulldogs start the season with a new quarterback (Hutson Mason), but so do Georgia's first two opponents -- Clemson (at home) and South Carolina (in Columbia, S.C.). Georgia also gets to play Auburn at home. 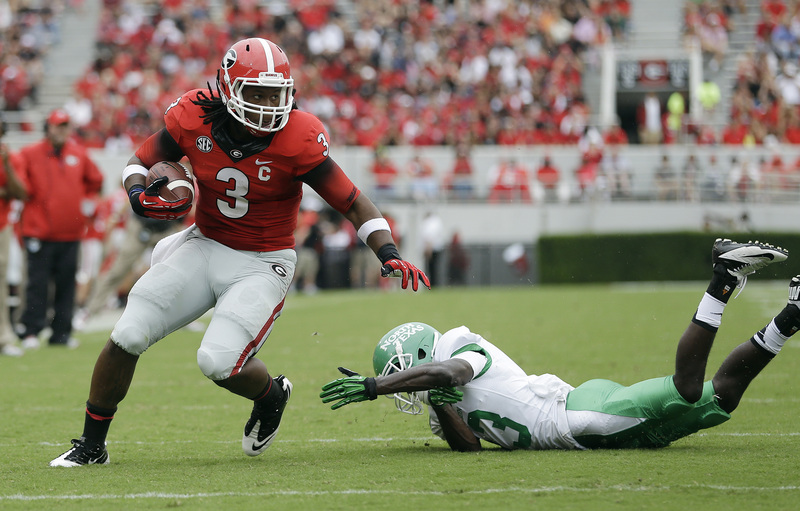 Georgia has a great running back -- Todd Gurley -- and an outstanding kicker -- Marshall Morgan. Baylor has a veteran quarterback (Bryce Petty) returning and will be playing in a brand-new on-campus stadium in 2014. Baylor has to go to Oklahoma and West Virginia, but otherwise it is not a real hard schedule. Baylor will score a lot of points. The Bears are returning 10 starters (six on offense and four on defense), including a very good linebacker in Bryce Hager. The Gamecocks might be featuring a new quarterback this fall (Dylan Thompson), but they return 14 starters, including a very good running back in Mike Davis and two standout offensive linemen. Thompson did get to play some last year as the backup to Connor Shaw. Coach Steve Spurrier is the magic man. How many head coaches have worked jobs in the NFL, USFL and won the ACC championship at Duke? This was a 12-2 team in 2013 and it returns 14 starters. The Tigers have a great offensive system with a quarterback in Nick Marshall to run it. And Sammie Coates is one of the top wide receivers in college football. However, Auburn faces a very tough schedule, playing at Ole Miss, Georgia and Alabama. Auburn does get South Carolina and LSU at home. The Tigers return 12 starters from a 10-win team. All three losses in 2013 came on the road. LSU starts a new quarterback in Brandon Harris. This is not good since the team opens the season against Wisconsin in Houston. LSU still has very good players and an outstanding coaching staff. Freshman running back Leonard Fournette is the key. LSU has lost a lot of players to the NFL draft recently, but also has great young talent. LSU's schedule also includes road games at Auburn, Florida and Texas A&M. The Trojans won six of their last seven games last season, and return 14 starters from a 10-win team. New head coach Steve Sarkisian knows the USC program well. USC plays a tough schedule, but possesses a very good young quarterback in Cody Kessler, an outstanding wide receiver in Nelson Agholor and defensive lineman Leonard Williams is one of the best in college football. The team has better depth, too. The Horned Frogs were a 4-8 team last season, but head coach Gary Patterson is an outstanding defensive coach and has added two new offensive coaches that should help a great deal. New quarterback Matt Joeckel -- the twin brother of Jaguars OT Luke Joeckel -- transferred from Texas A&M after backing up Johnny Manziel and will be a key player for TCU. TCU returns 16 starters, including defensive linemen Devonte Fields and Chucky Hunter, who are very good. The Horned Frogs do get to play Oklahoma at home this season. This is a very well-coached team with some good offensive players, including left tackle Andrus Peat, who is one of the best at his position at the college level. Quarterback Kevin Hogan started the last five games of his freshman year and every game last season. Receiver Ty Montgomery is also very good. The Cardinal have to play at Oregon, UCLA, Washington and Notre Dame. Check out the best images from the 2013-14 college football bowl season. This selection might shock you, since this team is 15-11 in the last two seasons. However, Ole Miss has some very good young players in the sophomore and junior classes. Quarterback Bo Wallace and wide receiver Laquon Treadwell are both good players.